As a child in Olympia, Washington, Toni Bogue wished on seeded dandelions – literally! – for endless supplies of ice cream. 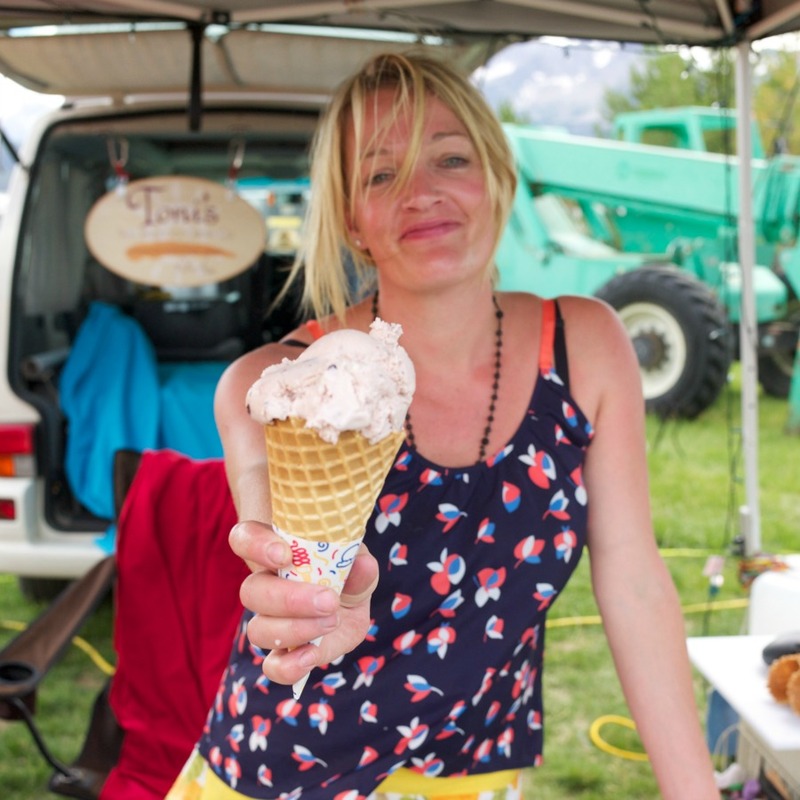 Twenty years later, her dream came true with the launch of Toni’s Sun Valley Ice Cream. Her fresh seasonal flavors (think huckleberry and pumpkin pie) handcrafted “with love” quickly developed a loyal following. Enjoy her ice cream by the pint at Atkinsons’ and Village Market; at local restaurants such as Sushi on Second and Zou 75; or at summer venues like Ketch ‘Em Alive. What do you love about making ice cream for a living? I feel fortunate to live in a place where people value real quality food. I have been doing this for 17 years now. There is literally a generation that has grown up with the memory and an endearment to Toni’s Sun Valley Ice Cream. It fills my heart to know that I’m part of their lives and experiences. I love my job! Which of your ingredients are produced in Idaho or in the NW region? I do my best to source as much locally as possible. I would say 80 percent of what I use comes from Idaho or bordering states…pretty much everything except for the Oreos & chocolates. All milk and cream come from Utah because Utah forbids the use of GMOs in dairy production and that is important to me. My vanilla comes from from Singing Dog in Oregon. I grow the majority of my own herbs, edible flowers and an increasing number of other foods. My garden is getting to a point of really producing! I took a gardening class through University of Idaho with this outcome in mind and it has really helped my overall yield. I also buy as much produce from Hagerman Valley as possible and luckily they grow almost everything quite successfully there. How important is organic when you source ingredients? It depends on the item. I have found quite a few studies that show that some “conventional” fruits and foods are just as good as organic (though I know plenty of other studies would disputes that). I always buy organic where the big offenders (i.e. strawberries!!) are concerned. I am honestly as concerned, if not more, with GMOs and rBST just because dairy is predominantly what my creations consist of. What have been your biggest challenges as a small local producer? Luckily, there is enormous support for local foods and for people who are devoted to their businesses and are willing to work hard. I feel so fortunate. Distribution is probably the biggest problem and the fact that I am often just wearing too many hats. With that said, I feel like it’s my job to embrace my challenges. Were/are you a “cottage” industry producer or have you grown beyond that? I am not a cottage industry. Producing dairy products is heavily regulated in Idaho. I have a dedicated production facility that is not at my home and have for the last 16 years, since the very beginning of my business. What is the most rewarding part about being a “homegrown” food producer? Being able to live and work and raise my family in this valley was always the goal. Mission accomplished in a very fun and fulfilling way! How important is a local/regional food system to you and your family? Extremely! In what ways do you support our local/regional food system? I have a 600-square-foot garden. I am currently growing practically everything that can grow here. It’s awesome! I love Wood River Sustainability Center and visit Waterwheel Gardens when Curtis comes to NourishMe every week.